Objective: Use and store batteries safely. Discuss the information below on different types of batteries. Ask workers to identify the battery types used in your operation. Show examples of the types of batteries you use and their features. Demonstrate how to connect a battery safely. Have workers practice connections as you supervise closely. Lead-acid storage batteries are chemical storage devices that produce power. The typical battery has a number of cells with layers of lead plates in sulfuric acid. When sulfuric acid contacts the lead plate inside the cell, energy is produced. 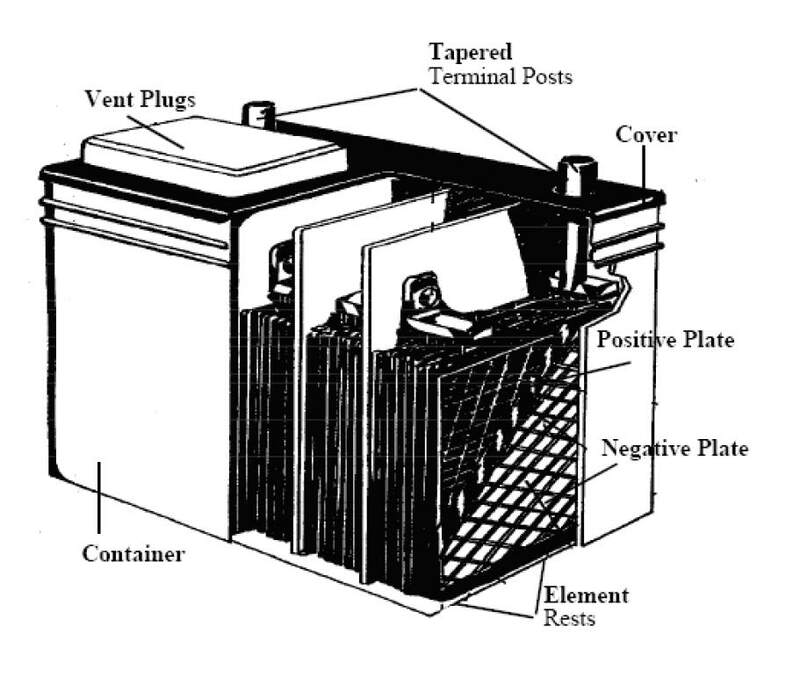 The main battery terminals are the positive and negative posts. The battery may also have vent caps on top. These permit the checking and maintenance of water and acid levels. They also provide a vent for the escape of gases formed when the battery charges. Car-starting batteries start cars and trucks quickly at minimum weight, size, and cost. These batteries have lead sponges rather than sturdy lead plates. These thin sponges are delicate and start to break down after less than 100 cycles. Deep-cycle batteries are compact and inexpensive. They should last for 200 to 400 charge-discharge cycles. These storage batteries are packaged in the same small automotive case and contain somewhat thicker plates of lead. Avoid acid spills by placing the battery in an upright and level position. Gel-cell batteries are used in aircraft and are portable. They are usually small and work in any position. They have sealed gel cells to prevent acid vapors and spills. If charged or discharged too rapidly, gas will build up, causing the battery case to rupture. Besides possible rupture, storage at temperatures above 78 degrees Fahrenheit accelerates self-discharge and shortens the battery’s life. This battery is more expensive but safer and cleaner. Lithium-Ion Batteries are often used in power tools. They offer more power and longer charges than traditional Nickel-Cadmium batteries, but poorly designed or constructed battery compartments can lead to overheating and fires. The National Fire Protection Association suggests choosing a device with the seal of an independent testing laboratory. Remove wristwatches, which might make electrical contact and create sparks. Wear gloves and a chemical apron when handling lead acid batteries. Sulfuric acid can cause painful burns that damage tissue. Battery surfaces often have a film of acid mist and lead that has leached out of the battery. Wear chemical splash goggles or a face shield with splash protection when inspecting or cleaning the battery. For more details, see the Tailgate Safety Training module Personal Eye Protection. If acid does enter the eye, immediately flush with running water for at least 30 minutes. See a doctor as soon as possible. Store batteries in a cool, dry place. Storage temperature should be between 32 and 80 degrees Fahreheit. Always make the negative/ground connection first, then the live connection. A match, incorrect connection of battery cables, or careless use of tools around the battery can set off explosive gases. Employers should provide face shields, aprons, and rubber gloves to employees handling acids or batteries [OSHA 1296.441(a)(5)]. Use proper lifting techniques when moving batteries. Batteries are small but heavy and awkward to lift. For more information, see the Tailgate Safety Training module Preventing Lifting and Overexertion Injuries. Do not allow the cable clamps to come into contact with each other throughout the process. Make sure both vehicles are off. Attach the positive (+) cable (usually red) to the positive terminal on the dead battery. Attach the positive cable to the positive terminal on the good battery. Attach the negative (-) cable (usually black) to the negative post on the good battery. Attach the negative cable to a solid unpainted metal surface on the vehicle that won’t start. Start the vehicle with power and allow to run for 2 to 5 minutes. Start the vehicle with the poor battery. Ensure there are designated battery charging stations, and that they are properly equipped. Batteries should always be stored in a proper manner in the right conditions. How to properly connect cables for the purpose of jump-starting a dead battery.